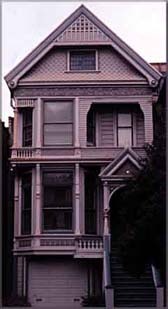 This house was home to Jerry Garcia, Pigpen, Managers Rock Scully and other associates. It was also the headquarters of H.A.L.O. which was the Haight Ashbury Legal Organization. Band manager Danny Riftkin lived in the basement apartment and the band lived upstairs. It was a popular community center until 1967 when the police arrested everyone for a very small amount of marijuana which was found on the premises. Garcia and his girlfriend were out shopping at the time. In March of 1968, the band performed a farewell concert from the back of a flatbed truck with power lines attached to the Straight Theatre. The Grateful Dead Band then moved to Marin County.